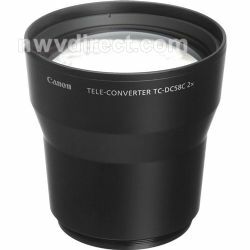 The Canon TC-DC58C Tele-converter Lens converts the focal distance of the body lens by a factor of 2.0x when attached. Note: lens will obstruct flash when used. Note: requires Canon LA-DC58H Lens Adapter to use with Canon G7 or G9 digital camera.